No running water from the pipe. That’s how I pictured Datak, a small village in Flores, where one of the Taman Bacaan Pelangi [Rainbow Reading Gardens]’s libraries are located. This time, I visited Datak with Jessy, Taman Bacaan Pelangi (TBP)’s secretary, and Lukas, a volunteer from World-Horizon that has been appointed to be full time volunteer for TBP for a year, living in Flores. 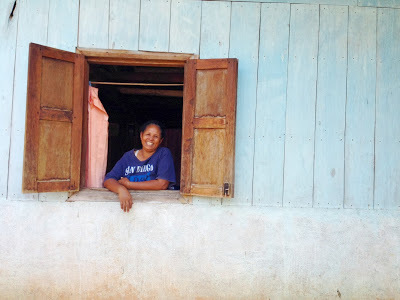 We stayed at Ibu Bosco’s house, a mother of Don Bosco, our volunteer. Her front house was made of wooden walls and the back part of the house, where the kitchen and dining room were located, was made of rattan. A simple house, yet full of warmth and happiness. Every morning, we would gather at the kitchen to have a cup of black coffee and bananas, while chatting with Ibu Bosco and listening to her stories. The sun rays slipped in between the rattan’s gaps, making the whole kitchen area looked beautiful. Just like in the old movies. Wearing a black woven sarong, West Manggarai’s traditional sarong, Ibu Bosco prepared our breakfast, which we would eat after taking a shower. The breakfast menu was the same as dinner menu. Rice, deep fried tempe with tomato, chicken, and fried instant noodle. Yes, we, Indonesians, loved big breakfast and we did eat rice for breakfast, lunch, and dinner! 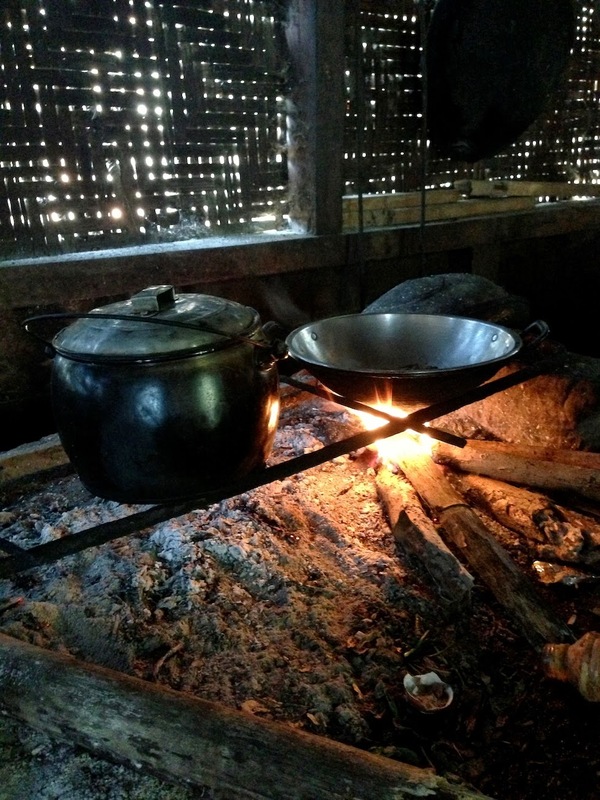 I always loved food that were cooked with wood fire. Somehow it tasted better. 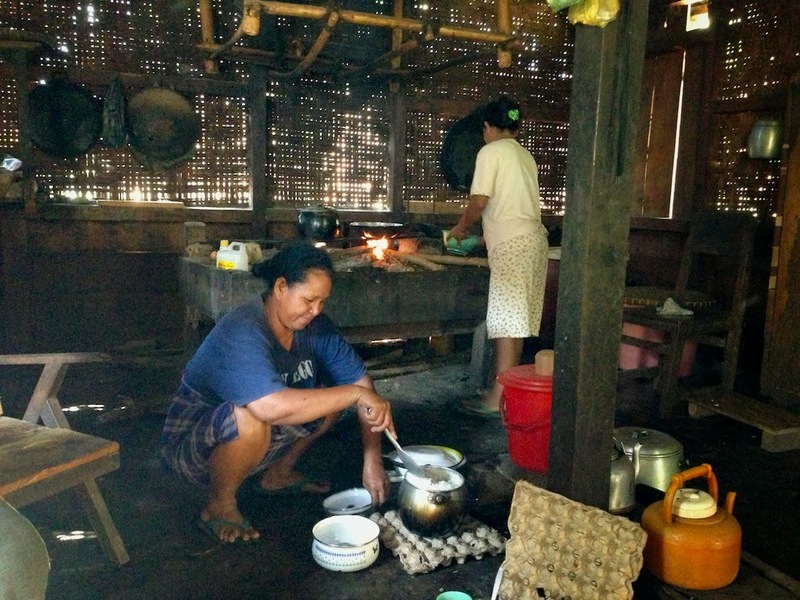 The smell of the wood fire from Ibu Bosco’s kitchen brought me back to my childhood time. When I was a kid, I always spent the whole month of school holiday at Grandma’s house and I would wake up every morning to accompany Grandma in the kitchen, cooking with “anglo” (wood fire). What a sweet memory. One evening, there was a new face in the dining table. I thought he must be one of Ibu Bosco’s relatives. But.. apparently I was wrong. He wasn’t part of the family. When introduced, I asked him whether he was a farmer, too. He replied, “No.. I’m not a farmer”. So, what do you do? I asked. He replied, “I’m a buffalo hunter”. What???!!! This guy, probably in his 40s, was a professional wild buffalo hunter. He didn’t hunt buffaloes with guns. Not that type of hunter. He basically tried to catch wild buffaloes in the forest. “He is very special. Not many people can catch wild buffalo in the forest”, said Don Bosco. Wow. Apparently, catching wild buffaloes need a special skill. It needed a strategy! I’ve never thought of it and couldn’t believe that such profession existed on this planet. Don Bosco continued, “My Mom has 11 buffaloes, but because now she lives alone, she has to let go her buffaloes in the forest. And now, this guy needed to catch them back”. Oh my God! It didn’t make sense to me that one would just let go 11 buffaloes, which worth 700USD per buffalo, in the forest with no guarantee that the buffaloes would return to the house at all. “Some people steal buffaloes in the forest, so that’s why it’s not easy to find our buffaloes”. Of course! How would you find buffaloes in such a big forest, especially knowing that other people would try stealing them, too? If this was an investment, it was definitely a bad one! Ha. Visiting villages made me see things from different point of view. 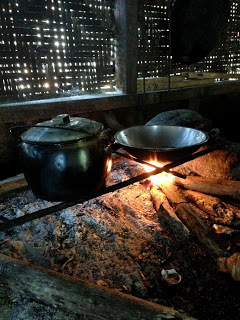 Learning the simplicity of people’s lifestyle and way of thinking, trying to be happy with what we have, dealing with tough nature – no water, off beaten path, etc, every single thing made me think of how big the differences were with living in the urban areas. One day, I needed to call my fiancee, but how could I call him if there was no phone signal in this village? Wait a minute… I remember one day Don Bosco’s younger brother took me to the phone signal spot. Where was it? 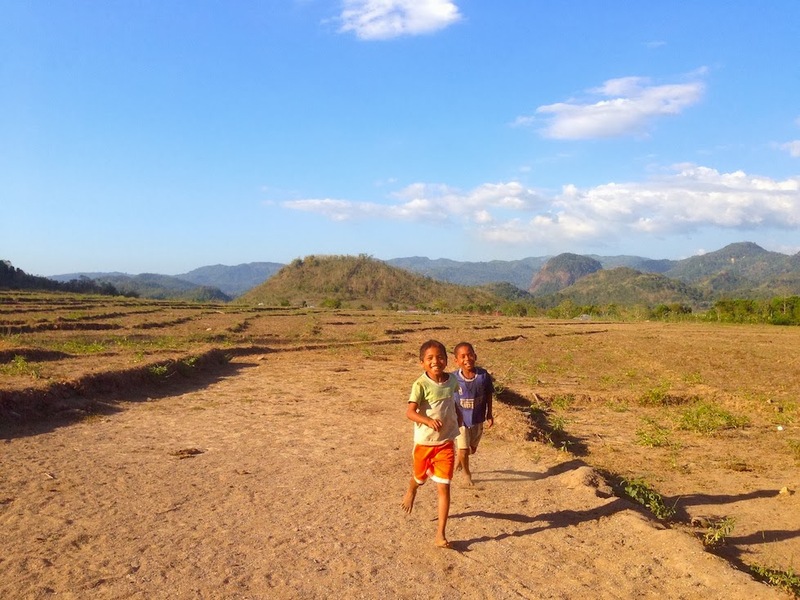 The phone signal spot in this village was located in the middle of… rice paddy field! Ha! Since this was dry season, the rice paddy field had turned into a big brown & dusty field. Dry season could be really rough in Datak. It was hard to grow anything. So, the local people lived based on the last season’s crop. Check out the phone signal spot. It was really funny to see people standing in the middle of rice paddy field holding their mobile phones in their ears. They even used a big chunk of tree trunk as a sitting bench, so people could sit comfortably while talking on the phone with their loved ones :). So romantic, wasn’t it? Sitting under a tree, on a tree trunk bench, talking to your girlfriend/boyfriend! I loved it. In the afternoon, people would walk on the dusty road, carrying a plastic bucket in their hand and a towel on their shoulder. They were going to the river to take a shower. They did all kinds of activities in this river… you named it… washing the dishes, doing the laundry, taking a shower, swimming, etc. They would go with their friends, so it was more like a fun thing to do in the afternoon and they definitely looked happy, even though they had to walk pretty far just to take a bath and would be sweating again from the walk by the time they reached home. But that’s the way they lived. And it was a normal thing to do. Having to take a bath in the river, cooking with wood fire, walking to the school with slippers because parents could not afford buying shoes, and many more. And people seemed to enjoy their life. They laughed so hard from ear to ear, as if they didn’t have any problems in life. It was my favourite, especially hearing Ibu Bosco’s laughter. Oh, loved it!! It was so crisp, genuine and full of happiness. I wish everyone could laugh like her. Especially us who live in the big city. Most of the time, we forgot how to laugh because we were so busy catching up the deadlines, meetings, assignments, and worrying about a lot of things. Ibu Bosco, whose buffaloes might be disappeared and got stolen by others, still could laugh like nobody’s business. A lesson that I learned from her. Never worry too much about a thing. Let’s laugh and enjoy life!